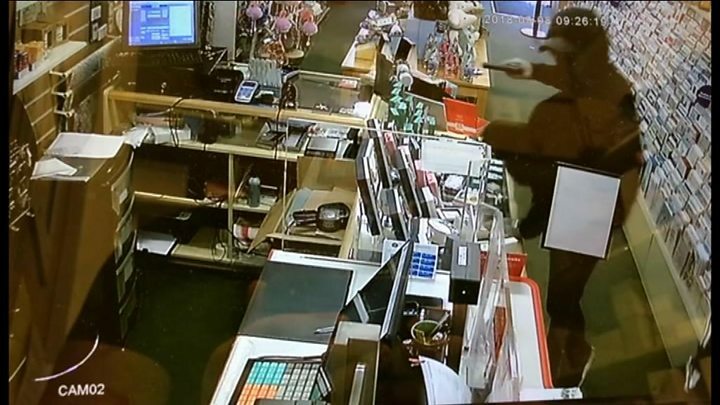 Media captionPost office manager Chris Liley said the robbers "shouted at" staff and "waved guns"
CCTV footage of an armed robbery by two masked men at a post office has been released. The two balaclava-clad men entered the post office in Burwell Drive, Witney, at about 09:30 BST on Saturday. Manager Chris Liley said they "shouted at" a staff member and "waved their guns", before making off with about £100 in cash. A 31-year-old from Witney has been arrested on suspicion of robbery, but searches continue for a second man. Mr Liley praised the employee who raised the alarm, adding: "She's very shaken and we feel for her having to go through this ordeal." "She had a split second from seeing the men running into the shop and she just reacted and slammed the parcel hatch shut which meant they couldn't get access to the post office," he said. "They banged on the door, shouting at her and waving their guns but she rang the police and set off the intruder alarm. "She did everything that you would hope she could do." Thames Valley Police described one of the robbers as a young man of slim to medium build wearing a black balaclava, black zip-up hooded top, black trainers and black jogging bottoms and black gloves. Officers said the other man was 5ft 10in tall and of slim to medium build. He was also wearing a black balaclava, khaki green/grey hooded top, grey jogging bottoms and black trainers with some blue markings. The force has not yet clarified which of the two men was being sought. The man who was arrested has since been released under investigation.